I’ve been waiting for your wedding gown posts! Thank you for explaining the process in an uncomplicated narrative and with photos 😉 I’ve watched women make corsets in Susan Khalje’s classes but never attached to a petticoat for a ballgown. This is fascinating, Mary! Glad you found this interesting. These are things that the pattern instructions fail to explain. Thank you for sharing your amazing sewing skills in such detail. I am a realitivly new follower so went back to read all your past posts. I have learned so much! Thanks again for the valuable information. Glad you find it interesting. I try and focus on techniques that aren’t so well known. Many sewing publications are geared towards fast and easy sewing. The lines of this dress are so graceful and will provide the perfect showcase for that lace. Such a dress needs its own set of good bones – thanks so much for showing us the underneath story! If only all gowns were made this way…simple yet perfectly suited to what the job is. 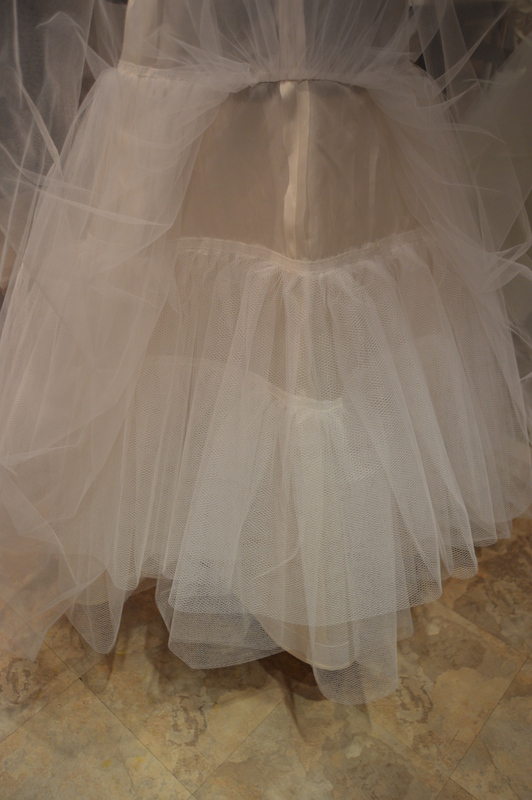 I am always amazed at the layers of netting all balled up under dresses from shops. I tell the brides that each layer of netting has a job to do and they must be steamed flat and crisp to hold the dress in a certain shape. 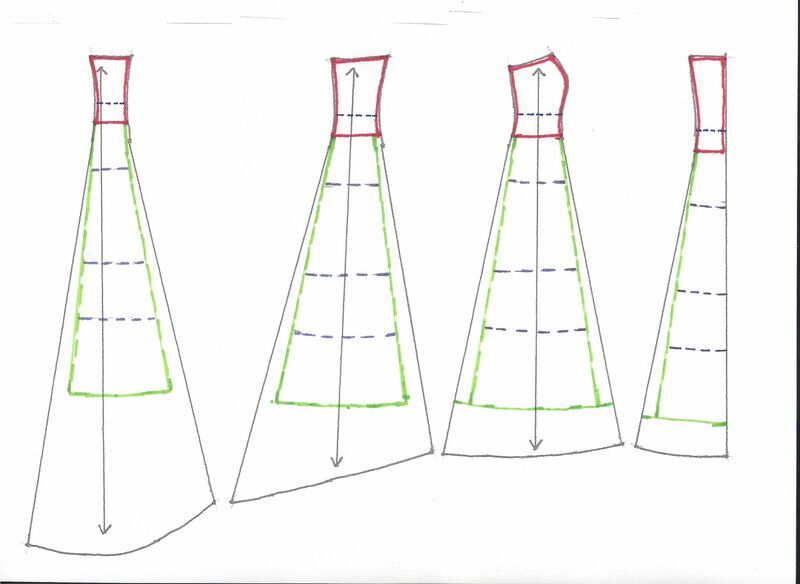 I’m looking forward to seeing the base of the dress evolve and sitting on the bride…will you have some live model shots? Hand sewing…such the perfect solution to trying to cram everything under the presser foot…even later alterations can skip machine sewing for understitching that top edge. If only more seamstresses would know these things…thanks so much for starting us on this journey with you, Mary! Starting from scratch and doing things right is so much easier than your challenges of reworking those RTW disasters. I’ve done both and dread those impossible remakes. I will definitely have live model shots in a future post. The silk dress is taking shape now; hope to get that post up soon. Wow! This is a perfect start. I’m always amazed by the number of layers, etc., underneath it all. I’m looking forward to seeing the whole process. Glad you enjoyed this. It would be nice if commercial patterns gave some clue as to the importance of the under layers. I’ve done custom wedding and formal gowns for years and am totally self taught. I’ve read every couture sewing book I can find and experimented loads on my own. Taking apart RTW gowns is also great education. There isn’t much written on the details of this type of construction so I hope to share what I’ve learned. Thank you so much for referring readers. Your blog keeps me smiling. I love this serie, thank you very much for sharing your process!! Thank you. Glad you are enjoying. 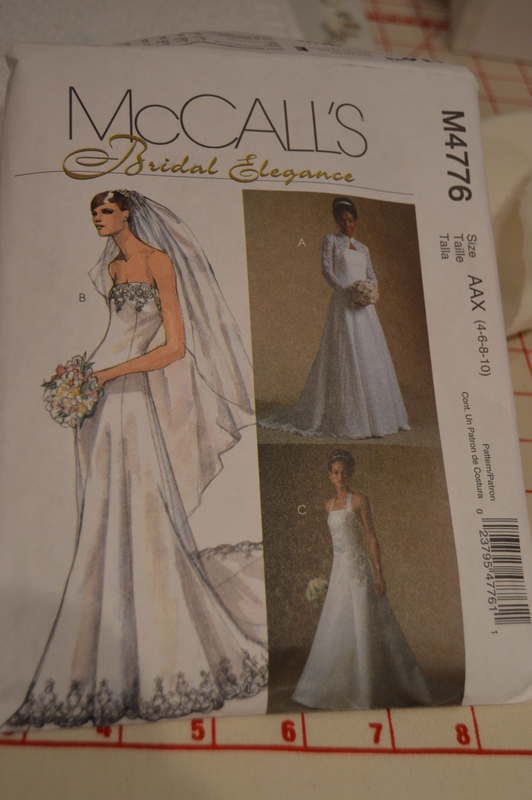 I’m about to start making my daughter’s wedding gown. 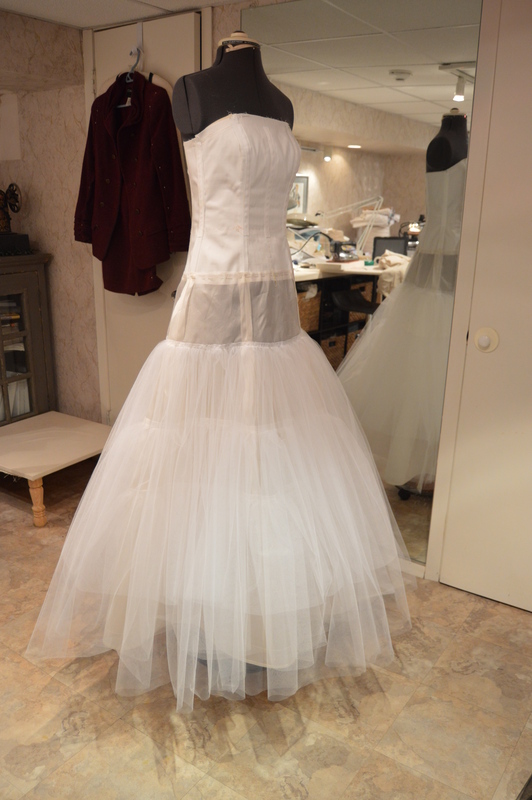 I’ve been wondering how the petticoat should be done. It’s marvelous to have your wonderful step by step to show me how. Thank you, thank you, thank you! Have fun with your daughter’s gown. It’s an exciting project to sew. If you need any further tips please let me know and I’ll try and help. Would love to see your finished creation. Besides gorgeous they are the key to the dress staying up and holding its shape. Glad you enjoyed and thank you. What a lovely, understated post. And what a gorgeous set of layers. I agree with symondezyn that it is pretty enough to wear already. Most of all I appreciate the information you are sharing, and the concern for the absolute comfort of the bride. Thank you Mary. 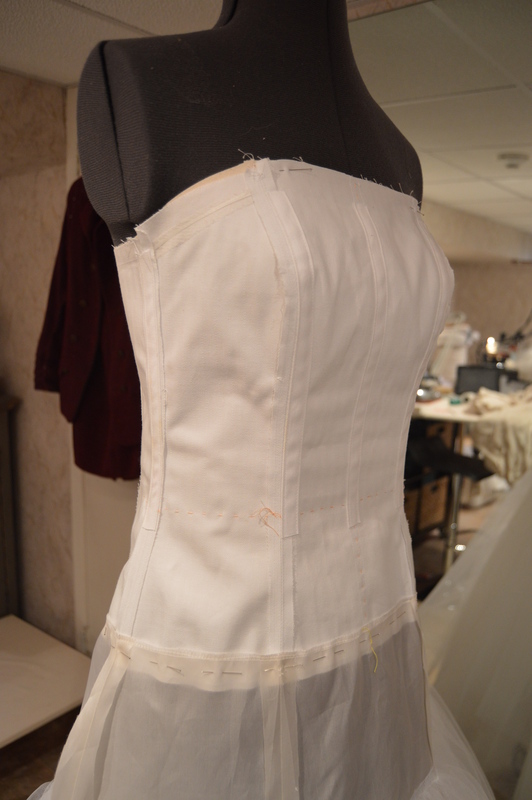 All the under layers and boning are the key to having a heavy gown comfortable and not fall down. I hate watching ladies hoisting their strapless gowns up all evening. 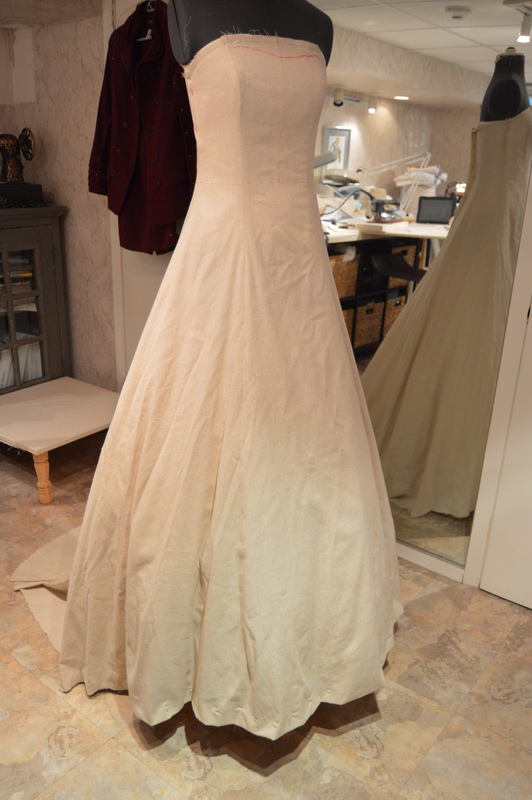 The muslin lays beautifully so I can only imagine how magnificent the dress will be. Beautiful couture work. Thank you for taking the time to share. Thank you. Photos of dress construction coming soon. I just discovered and followed your blog. What a gold mine of information! I am just returning to sewing and have completed one (!) project. Can only dream of having the skills you and so many others have. Beautiful work! I’m happy you find my projects informative and inspiring. We all started somewhere. I’m always happy to answer questions. Happy sewing. Thank you! Have already changed up my first garment choice…oooh, remembering how time consuming and FUN fabric shopping is. This could be dangerous. Thank you so much for this posting…I am anxiously awaiting the next one. I will be/am making my daughter’s wedding dress and your post inspired some new ideas! Thanks! Love the details and the explanations! Fabulous! The next installment should be up in the next couple of days. 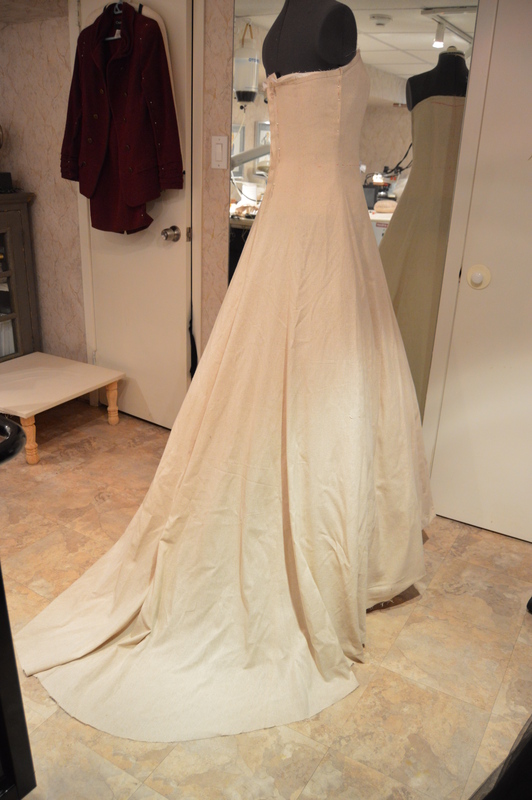 We did a fitting so I now have photos of a partially completed gown. Enjoy making your daughter’s dress. Even though the style of hers I’m sure will be different, much of what I’m showing applies to every gown. I’m always happy to try and help if you want another opinion as your work progresses.